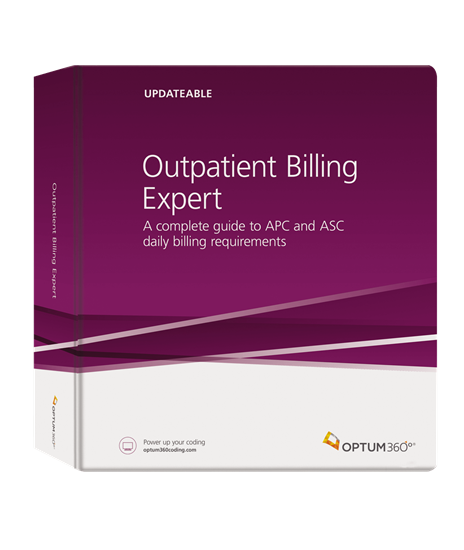 free-standing ambulatory surgical centers (ASC) billing outpatient claims. Outpatient Billing Expert provides detailed references with payment information and guidance to improve reimbursement and reduce claim denials. This all-in-one resource also provides APC and ASC groups, reimbursement amounts, coverage issues, and information on what is not covered. Comprehensive coverage of both ASC and APC payment systems. Establish the right payment and audit reimbursement processes for your facility. Includes the most recent code sets and information from CMS and other industry sources. Keep all billing current and accurate using up-to-date rates and groups for the APC and ASC payment systems. Contains information used on a daily basis by HOPD and ASC facilities. Resolve billing and denial issues, and establish payment and audit reimbursement processes. Easily determine fees and payments prior to submitting your claim. Includes fees, formulas, and tables to determine appropriate APC or ASC reimbursement. Quarterly print updates. Stay current with regulatory changes specific to your facility. Easy-to-use format organized by tabs. Easily locate the billing information needed to speed the submission of claims.